It’s back to school week. While the traffic gets worse, the trains fill up with kids and the feeling of summer holidays fade, I have to return to work. This wouldn’t normally bother me, well it hasn’t in the last year that I’ve been on maternity leave but now my real juggling act begins. So far it has been pretty stable transition, easing into work while Rafaela has been slowing engaging in day care activities and it seems like she is adapting well. It is really hard to leave her after spending so much time together. However I can already see her growing and learning so much. She still crawls commando style and is absolutely filthy when she gets home but she is almost up on to her feet and can say “bye” and “up”. I am still in two minds about heading back to work. I am happy to be back and stimulated again, however I miss being at home and moving at our own pace. I really enjoyed having time cook and consider meals. Now that’s reserved for the weekends. Before Rafaela (circa 2011), my husband Andrew, would cook up Spag Bol as it’s his favourite meal. 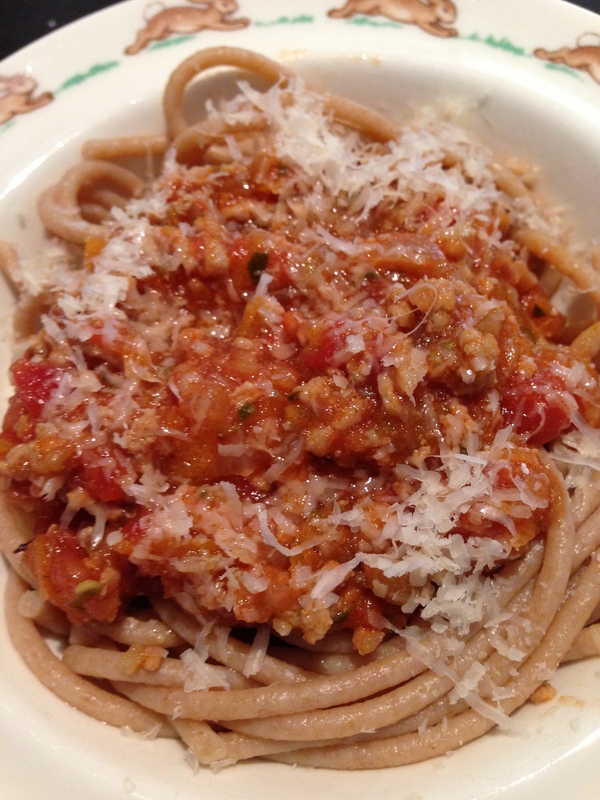 Everyone has their version, Spaghetti Bolognese is the quintessential family staple meal… right. This one is Dad’s and Rafaela absolutely loves it. It will be high on the weekday rotation in this house! 250g of organic mince (beef or pork/veal) – I’ve use the Aldi Brand of Organic Beef. Heat the oil in a saucepan (large enough to hold 5 cups of liquid). Using a food processor finely chop the onion and garlic together. Transfer to the saucepan and cook until soft. In the mean-time add the zucchini and capsicum to the food processor and chop finely. Add grated carrot to the pan and combine well. Cook for 2 minutes and then add the mince. Use a wooden spoon to break up the mince. Once the meat is no longer pink, add the dried herbs & pepper and stir. Then add the zucchini and capsicum, stock, tomatoes, stir to combine. Bring to boil and then simmer for minimum 20min to 1 hour or until the liquid has reduced. Serve with Organic Spaghetti, Wholemeal Spaghetti or rice or couscous, anything you want. Rafaela likes to slurp up the noodles. She is so fascinated by the action. We just cut the noodles into manageable sizes. This meal is also extremely freezer friendly and obviously enjoyed by mum & dad too.